These days I only eat roast chicken. Seriously. The best part of this dish is the lemon. It gave the chicken and veggies a nice tangy taste. I can barely think or type today because it’s so hot. It’s 28ºC (82ºF) but feels like 34º(93ºF). I wish you a lovely day. Mine is lethargic!!!! 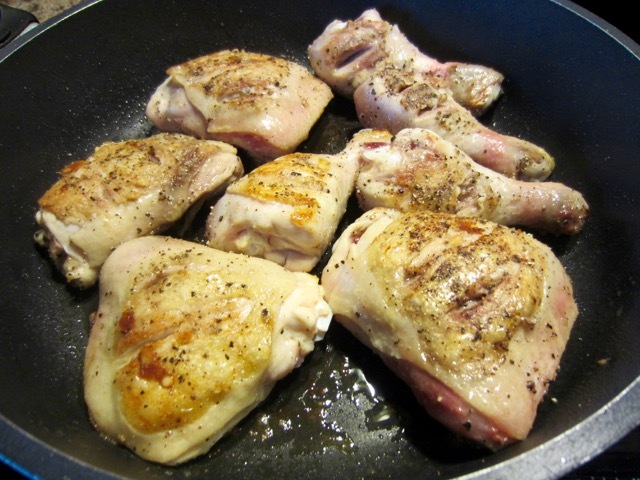 Make 2-3 slits on each chicken piece and season with salt and pepper. 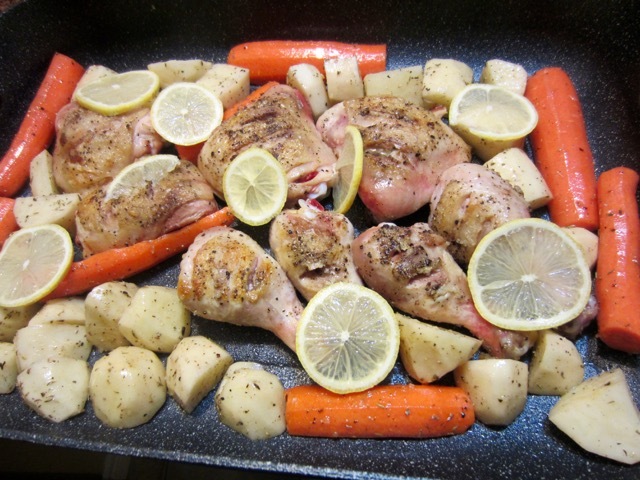 Transfer the browned chicken to the roasting pan. 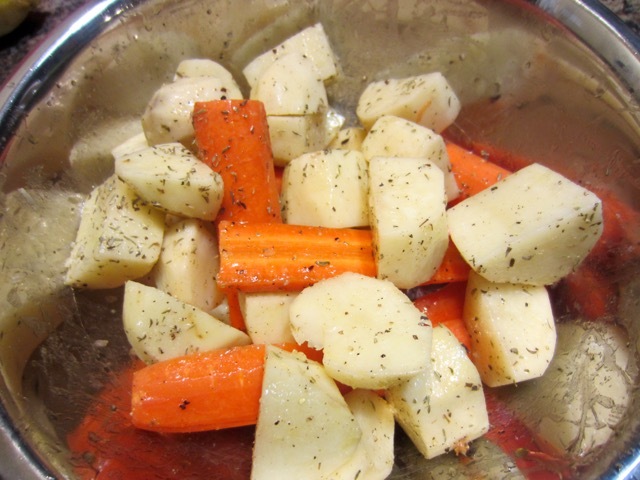 Toss the potatoes and carrots (and bell pepper if using) with salt, freshly ground pepper, thyme and 2 tablespoons olive oil. Transfer veggies to the roasting pan, placing the cut side down. Scatter the lemon slices on top and and bake for 15 minutes. 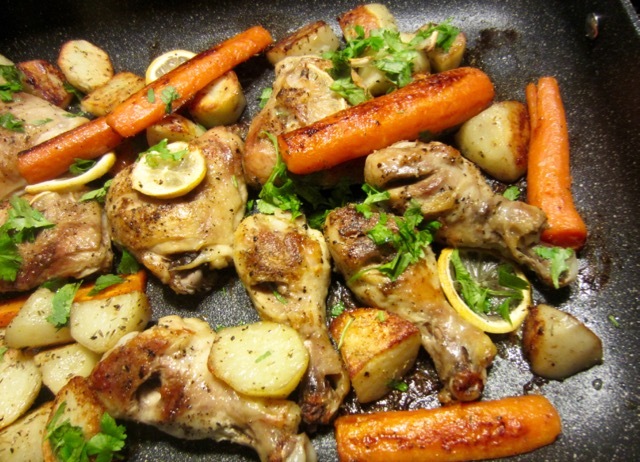 Remove from oven and flip drumsticks, potatoes, carrots and bell pepper, over. 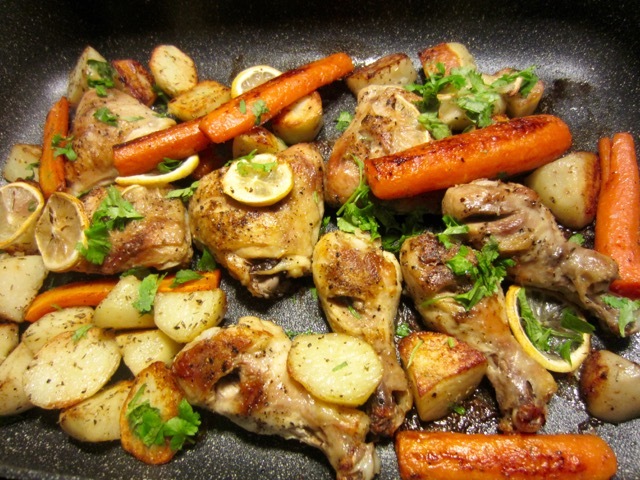 Return the roasting pan to the oven and bake another 15-20 minutes or until fully cooked.. Remove from the oven, add shredded cilantro and cover with aluminium foil while you make gravy. Roasting juices from the pan. Preheat the oven to 425ºF (220ºC). You will need a 10 x 15 inch roasting pan. 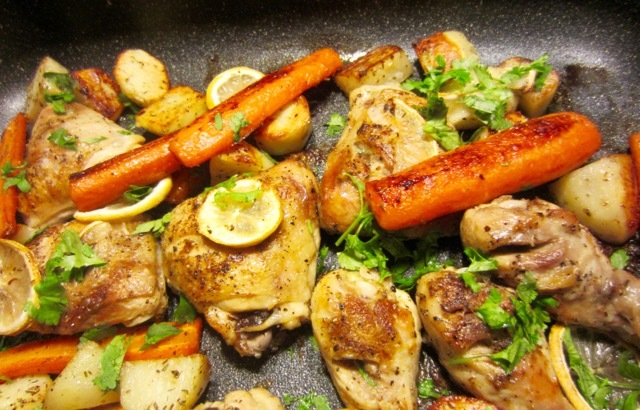 Brush the roasting pan with oil. (I used a Rock Heritage 12 x 17 inch roasting pan). 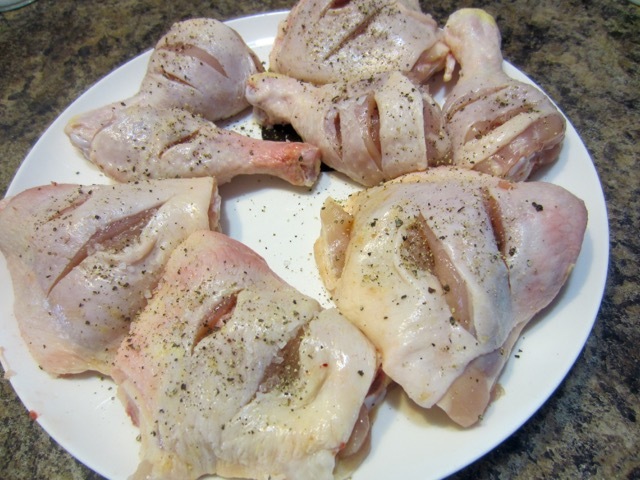 Make 2-3 slits on each chicken piece and season with salt and pepper. 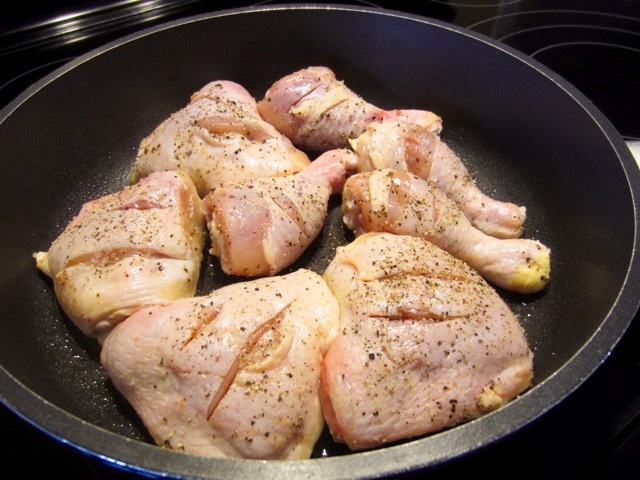 Heat 1 tablespoon olive oil in a large heavy based skillet over medium high heat and brown chicken on both sides. (about 4 minutes on each side). Transfer to the roasting pan. Toss the potatoes and carrots (and bell pepper if using) with salt, freshly ground pepper, thyme and 2 tablespoons olive oil in a bowl. Transfer to the roasting pan, placing the cut side down. Scatter the lemon slices on top and and bake for 15 minutes. 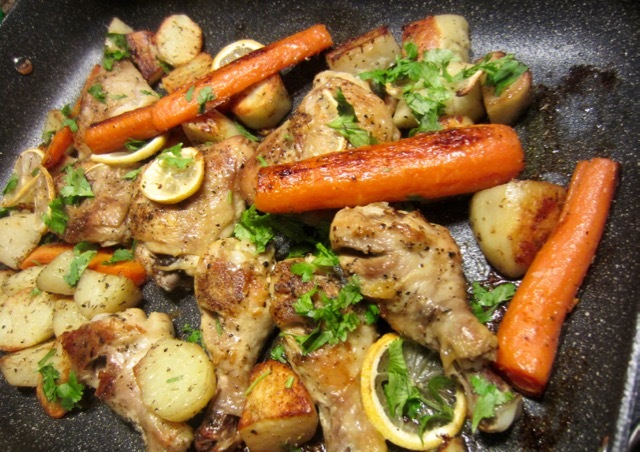 Remove from oven and flip potatoes, carrots and bell pepper over and bake another 15-20 minutes. Remove from oven, add shredded cilantro and cover with aluminium foil to keep warm, while you make gravy. Omg you work in Guelph? Cool! I totally agree with you regarding lemon flavour. Todays weather has been awesome. Have a lovely week! Thanks. I go to Elmira from time to time. Have a nice week! Oh yes. My mistake. Have a great week! Interesting, I just took a chicken breast out of freezer to thaw. Might give this a try tonight. The morning clouds gather but I suspect they will burn off later, meantime it’s just cool! Im so envious of your temperature in your part of the world! Enjoy it Liz! what do you mean envious? It’s way too hot. I can’t wait for the temperatures to go down slightly. I did some pruning in the early morning and I need to finish picking up the twigs I threw all over the place. It’s way too hot right now. Have a lovely day Sandy. I hope you enjoy your lean piece of chicken. I usually just stir-fry chicken breast, after marinating. Take care! It’s so much cooler today. You know Guelph is usually so cold (colder than Toronto) but this year we’ve had warmer temperatures. I was out walking at 6.30am in a tee shirt. Nice cool breeze. I really enjoyed the walk and dreaded the fact that the weather always changes back to winter. Have a great weekend!